Presenting the advanced Glamour Programmed FI, It comes with FI system which injects the right amount of fuel into the cylinder, based on data calculated using hi-tech sensors. Its Integrated Braking System ensures a comfortable and stable riding experience. With its Real Time Mileage Indicator, Glamour Fi gives you the power to control the mileage by displaying the fuel consumption in real-time. Combined with a powerful 125cc TOD engine and attractive body graphics, this masterpiece makes you stand out and stay ahead. The new model Glamour FI bike comes with a system that injects the right amount of fuel into the cylinder, calculated by the data received through hi-tech sensors. Check out all the all-new Glamour FI bike images for a closer look at the specifications of the bike. 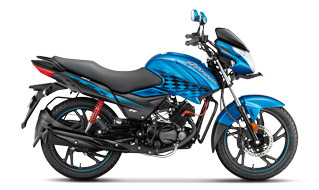 The 125 cc Glamour FI bike offers excellent drivability, optimum fuel efficiency, lower emissions and an instant start. With Real Time Mileage Indicator, it gives you the power to control the mileage by displaying the fuel consumption in real-time. The 125 cc Glamour FI bike is loaded with a powerful engine and stunning graphics which is guaranteed to make heads turn. To find out the price of the Hero Glamour Programmed FI, simply contact your nearest dealer and get the on-road price of the bike in your area. You can find out the price of the 125 cc Glamour FI bike in cities such as Mumbai, Delhi, Pune, Bengaluru, Chennai, Chandigarh, Kanpur, Lucknow, Kolkata, etc. The 124.7 cc powered engine coupled with the right kind of fuel will give you the mileage you are looking for. With a max power of 8.6 kW @7500 rpm, you can expect the Hero Glamour Programmed FI to give you a better average than its counterparts with similar specifications. The new model Glamour FI bike has telescopic hydraulic shock absorbers in the front and 5 step adjustable shock absorbers in the rear, giving the motorcycle the perfect balance it requires on rough terrains! Built with a fuel tank that has the capacity of 10 litres, the Glamour FI Motorcycle Mileage will take you as far as you want to chase your dreams. This super amazing bike has a 12 V - 3 Ah (MF4) Battery that lasts longer on even your longest rides, making the Glamour FI the best 125 cc bike. The features and specification such as suspension, engine, tubeless tyres and fuel capacity make the Hero Glamour Programmed FI the ideal bike for long, peaceful rides in and out of the city. What’s more, the Glamour FI motorcycle mileage makes your road trips even more economical! Do make sure to check out the Glamour FI bike photos! You can also explore the 360° view of the Hero Glamour Programmed FI bike to understand the specifications in detail.